For WishCasa: To/From Helsinki with love. I had the pleasure to collaborate with WishCasa Magazine on their one-year anniversary issue. I was invited to write about the wonderful city I have been calling home for the past two years: Helsinki. WhishCasa is a breath of fresh air in the Brazilian design scene. It was a pleasure to work with them. Congratulation and thank you! Long live WishCasa! Below is the first part of the original article in Portuguese as well as a rough English version, so our international friends and partners wouldn’t feel left out. 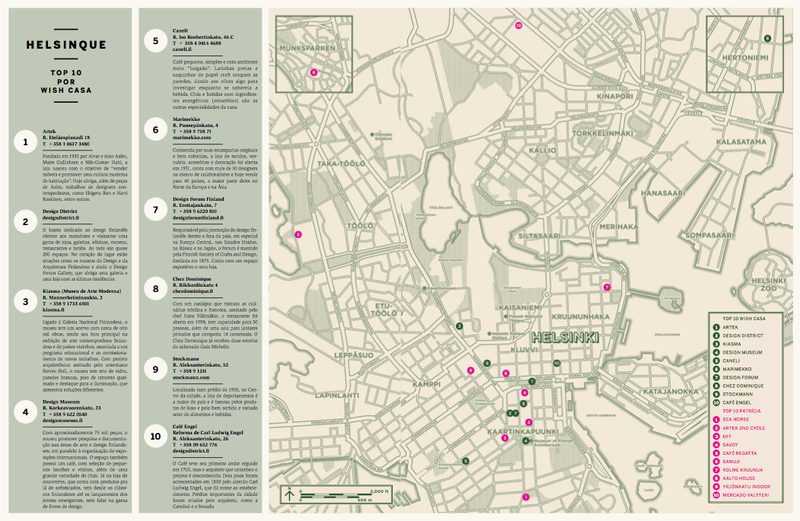 The entire article consisted of my ten favorite places in Helsinki, which I promise to gradually post, one by one, along with its English translation. 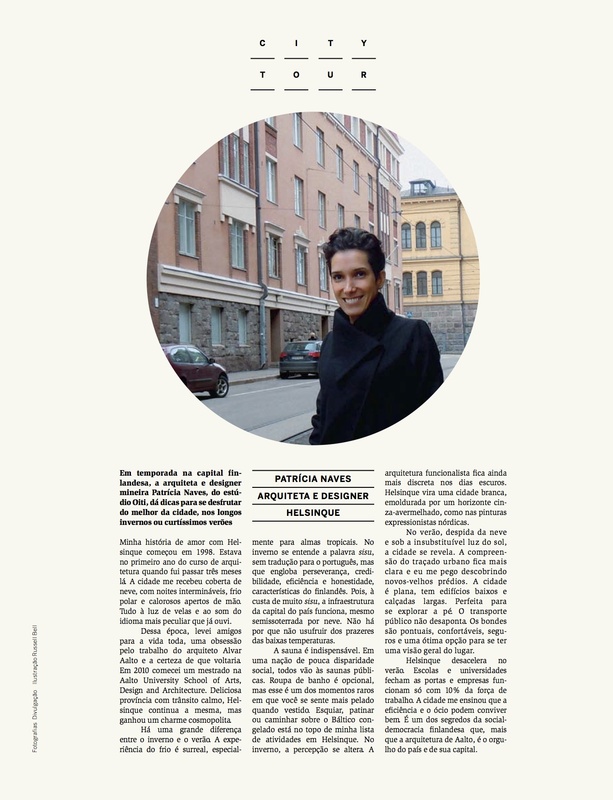 My love story with Helsinki began in 1998, when I went on a three-month exchange programme to Finland, soon after starting architecture school. The city greeted me covered in snow, with endless nights, warm hand shakes, candlelight and in the most peculiar language I have ever heard. From this time, I left with friends for life, an obsession with the work of architect Alvar Aalto and the certainty I would be back. 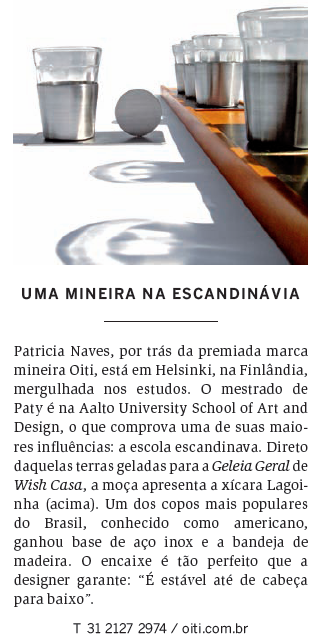 In 2010, I started a Master’s Programme at the Aalto University School of Arts Design and Architecture. Helsinki has not changed much, it has remained a lovely slow paced place which has gained a cosmopolitan charm over the years. The difference between winter and summer is remarkable. The experience of the Finnish cold weather is surreal, especially for tropical souls. In the winter, the word sisu, is easier to understand. Lacking a precise translation to English, its meaning would be a compilation of perseverance, credibility, efficiency and honesty, characteristic of Finns. Relying on a lot of sisu, the infrastructure of Helsinki runs smoothly, even under piles of snow. There are no excuses for not enjoying the exotic pleasures of low temperatures. The sauna experience is indispensable. In a nation of small social disparity, everybody goes to the public saunas. There bathing suits are optional, however this is one of the rare moments when you feel more naked if dressed. Walking over the frozen Baltic Sea is at the top of my favourite activities. In the winter, the perception of the city is altered. The functionalist architecture seems to be even more discrete in the dark days. Helsinki becomes a white town, framed in a grey-reddish horizon that resembles the Nordic expressionist paintings. In the summer, snow-free and under the irreplaceable sunlight, the city reveals itself. The perception of the urban plan becomes clearer and I find myself discovering new-old buildings everyday. The city is mostly flat, composed by short building and wide sidewalks, perfect to be explored on foot. The transportation system does not disappoint. The trams are punctual, confortable, safe and a great option to see a lot in little time. Helsinki slows down in the summer. Schools and universities close their doors and companies work with limited workforce. Helsinki taught me that efficiency requires leisure time. Perhaps, this is one of the secrets of the Finnish well fair state, of which, more than the architecture of Aalto, Finland and its capital are most proud.